Will women ever outperform men? And more interestingly, does it already happen! To begin with, we have to show our hand a little in order to open the discussion. The theory has long been that during shorter duration running, women will always be at a disadvantage because they lack the strength of men. This is due to the much higher levels of testosterone of men, which is responsible for a number of different physiological attributes. Firstly, men have a higher percentage of muscle relative to body weight than women. They also have lower body fat percentage. Red blood cell mass and haemoglobin content are also different (though this is more significant in the longer distance running events). But key is the greater strength – sprint events, even middle to long distance track events require substantial strength because each contraction relies on force to generate speed. And so it’s the testosterone that has perhaps the biggest influence. In fact, a really fascinating piece of analysis was done recently on this very factor, but we’ll save that over for tomorrow’s post, when we look in more detail at the physiological differences between men and women. So we generally accept that women are not as strong and hence not as fast over shorter distances. But the theory is that as you get longer and longer, women will come into their own, because they have a greater fat reserve and hence will be at an advantage in events where the use of fat as a source of energy is important. In other words, marathons and over. So, the metabolic advantage enjoyed by women would, in theory, close the gap between men and women as one gets longer and longer. Also, strength in terms of muscle force-producing ability is less important in the marathon and ultra-marathons, so the advantage of men is eroded anyway. And this is the context in which everyone seems to react so strongly when a women’s world marathon record is broken. It’s as though people see it as confirmation that the theory is true, and women will catch up. It’s even more the case in the ultra-marathons. In South Africa, we’re long-distance mad, and thousands of people take part in the Comrades Marathon – 89km long – every year. The most famous case of a woman threatening men’s dominance came in 1989, when a Benoni school teacher named Frith van der Merwe lined up at the 89 km Comrades Marathon and smashed the down-run record by a whopping 50 minutes! In so doing, she finished 15th overall, which was comfortably the best finish by a woman in what until 1975 had been a men’s only event! I vaguely recall the man who came 14th sprinting across the grass as though his life depended on it in an effort not to get caught and passed by a woman! That performance, and a few others by van der Merwe and a woman from the USA named Ann Trason, opened a discussion about women one day winning the race outright! Tomorrow, when we look at the difference in records, we’ll evaluate this possibility in more detail, but for today, we concern ourselves with the history and look at what the evolution of the records might tell us in the marathon event. If you do a Google search on the topic, you discovery that the first woman to record an official time for the marathon was Violet Percy from Great Britain. She ran the Poly Marathon in 1926, and finished in a time of 3 hours 40 minutes. Authorities felt that it was unsafe for women to run any further than 800 m, and so women were officially banned from competing in marathons after this! An interesting fact, that you won’t see on Google, is that the first woman to finish the Comrades Marathon was Frances Hayward in 1923, three years before Percy ran hers. So we might say that Violet Percy ran the third marathon for women, because Hayward ran two marathons in one go before her! Her time (11 hours 35) was also unofficial, and it took over 50 years before women were allowed to run Comrades! 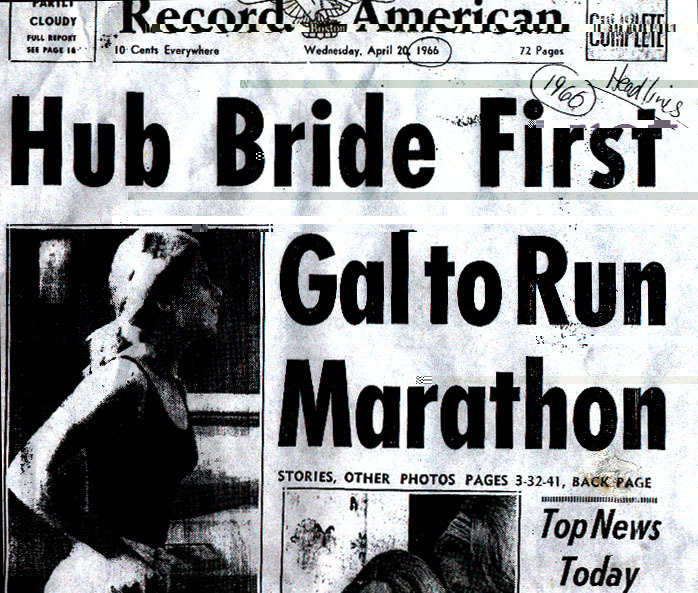 Women’s marathon running then went quiet for the next 37 years – no woman was allowed to take part in either a marathon or the Comrades, so the next “official” woman’s time came in 1963, when Merry Lepper ran 3 hours 37 minutes in Culver City. This makes Violet Percy’s record one of the longest standing in history, on a technicality! It also means that women have been running marathons for only 40 years! Famous stories, like that of Roberta Gibb running “as a man” in Boston in 1966 (picture above right) illustrate just how challenging the environment was for women runners. Some of you reading this, then, may even recall a time when you, as a woman, did not have this option. That puts into perspective that the women’s marathon, in constrast to the men’s event, is a very young event. This started a sudden ‘boom’ in women’s marathon running, with every major marathon letting women compete for the first time. As one might expect, the sudden inclusion of talented women, together with improvements in the way they prepared and trained for the event meant that the world record fell rapidly, dropping by an hour and 12 minutes between 1963 and 1980. The graph below shows these times plotted against time. It’s quite clear that the floodgates opened and up until about 1980, the record was plummeting down. It was at this stage that the first talk was heard of women one day beating men in the marathon. If we look at the graph above, we can see how at a basic level, people were predicting in 1980 that if the women continued to improve, they would be outrunning men by 1990! Of course, they often missed the point that comparing the times was not really fair, because the events were at such different phases in their ‘life-cycles’. 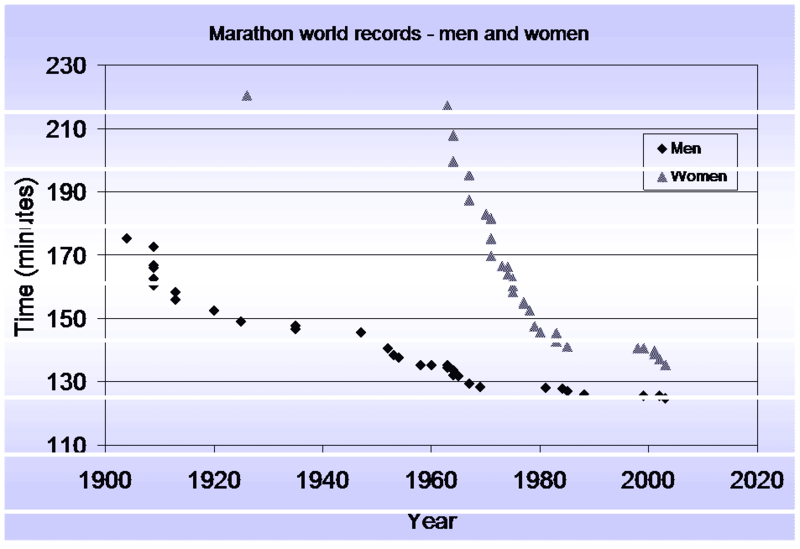 Nonetheless, scientists got involved and using the data on the graph, combined with some very impressive looking statistics, managed to work out that even taking into account the difference in stages, the women’s and men’s marathon records would be equal by 1998! That never happened (to the relief of men everywhere, no doubt! ), and the times started to level off, until Paula Radcliffe moved the event forward by a quantum leap again in 2002/2003. You can see this sudden drop in the times around this point, and this was the reason for the excitement, which renewed talk that the women would soon be mixing it with the men. Previous experience has tempered that enthusiasm, and so this is likely to be premature talk as well. As an aside, Paula’s current world record is still incredible, an opinion borne out by the fact that she could have won just about every single men’s marathon in South Africa in 2006. I imagine that this is the case in many countries…So she certainly is flying the flag for women runners! Looking ahead – will women one day beat men?